Studying is simply a part of life growing up, even for those who don’t decide to attend college. Some people are naturally more focused on studying, while others have a hard time finding the patience to do this. 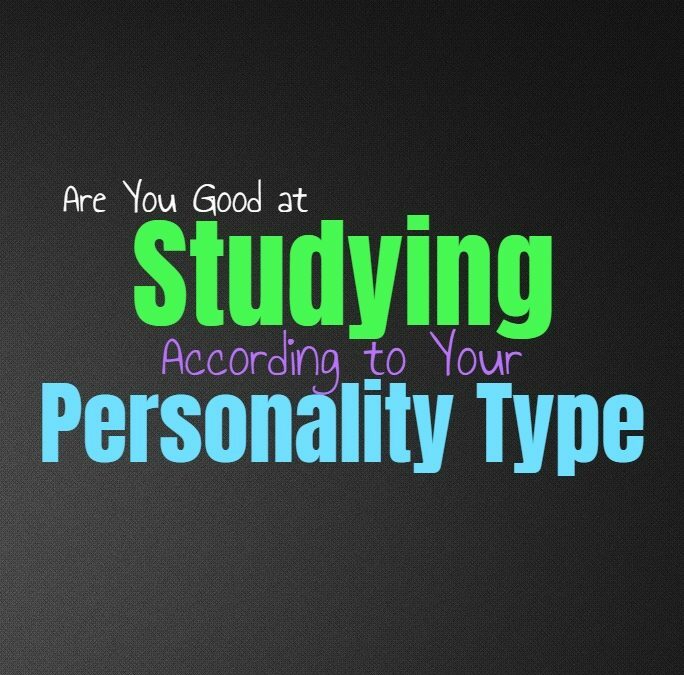 Here is how good you are at studying, based on your personality type. INFJs are often great at studying and knowing how to absorb the right information. They are natural researchers which is something that helps them when it comes time to study. They might struggle more with subjects which are boring and a bit too simple for them though, since INFJs actually like learning and growing their minds. For them it usually isn’t challenging to find time to study, and often getting good grades is important for the INFJ. ENFJs are often naturals when it comes to studying, especially since they believe in working hard and finding ways to grow. For the ENFJ studying is important since they want to be able to get good grades and be knowledgeable people. They are perfectionists and so for them failure really isn’t an option in their lives. They find the time and effort to study when they need to know, so that they can get the grades they want, and be seen as intelligent people. INFPs often enjoy doing research and even studying, but it depends on the subjects at hand. INFPs do have a hard time feeling obligated to study subjects which they aren’t inspired by. They don’t like feeling forced to study for the sake of passing tests, and so sometimes INFPs can lack the motivation to actually do this. They often enjoy researching and learning about new things, but once they feel like it is a requirement it becomes a bit more challenging for them. ENFPs are often great at researching and remembering facts, but studying for things they aren’t interested in can be draining for them. They might not be that great at studying when they are in school, because there are subjects they are forced to learn about and this just isn’t intriguing for them. ENFPs want to feel free to learn about whatever they want, and so they will do well at studying things they are sincerely passionate about. INTJs are often naturals when it comes to studying, even with subjects they don’t really care for. For the INTJ any learning is worthwhile, since they prefer to be knowledgeable and don’t appreciate ignorance. They work hard to expand their minds and will work especially hard to study when they have a test or some reason for it. They care about doing well in school, and so for them studying is an important part of this process. ENTJs are often naturals when it comes to studying, even though they don’t always have to. ENTJs believe in learning and being prepared for everything and this includes doing well in school. They focus on being efficient and so it is important for them to work hard and be successful. When it comes to school and needing to do well, or even the workplace, ENTJs will study whatever they need to and they will often be great at it. INTPs do enjoy researching and learning and so they can often be good at studying. At the same time INTPs don’t often enjoy feeling obligated to study, and so they might put this off when they are in school. They are usually great at knowing how to study and which aspects to memorize, but INTPs can become bored with subjects they already know and are forced to study up on more. They often lack motivation unless it is something which challenges and inspires them. ENTPs are often great at studying when it is about a subject they sincerely want to learn about. At the same time ENTPs don’t like feeling obligated to study in school and so they might lack the motivation to do this. They care about learning and researching, and enjoy being able to grow and challenge themselves. While ENTPs can be great at studying, they really don’t like when they feel forced and so sometimes they might slack off in school. ISTJs are often great at studying, especially when they know they have to. They care about being successful and for them getting good grades in school is important. ISTJs will go out of their way to ensure that they have learned all of the material and can be fully efficient when it comes time to proving this. They are often naturals when it comes to finding the motivation and just taking the time to study the way they need to. ESTJs are often good at studying and absorbing information without really having to try all that hard. At the same time ESTJs do try hard with everything they do because they want to always push to be better. They care about doing well in school and in the workplace, and so if they need to study something they will work hard to learn every part of this subject and be excellent at it. ISFJs are often good at studying, especially when they know they have to. They care about being successful, and want to be able to be good in school and when it comes to the workplace. Whatever reason the ISFJ has to study for, they will push themselves and find the motivation to be great at it. ISFJs know how to absorb information and will memorize the parts they need to in order to be successful. ESFJs care about being successful and for them failure is often not an option. They don’t want to let others down and so they work hard to get things done. When it comes to studying ESFJs are often good at this and will find the motivation to do what they must. Even if this can be a struggle at times because they have so many other things to do, ESFJs don’t want to fall behind or do anything which might be deemed as a failure. ISTPs might have a hard time finding the motivation to study, especially when they are younger and in school. Feeling obligated to study a subjects which doesn’t inspire or excite them, is often draining for the ISTP. They care about learning and want to expand their minds, but they don’t like having someone force them to do this. ISTPs might procrastinate when it comes to studying, and do this at the last minute or blow it off completely and just wing it. ESTPs don’t like feeling obligated to do anything and so studying might be something which frustrates them when they are younger. While ESTPs are good at studying and remembering facts, it is more about finding the motivation to do this. They simply don’t like feeling forced into something, especially when the subjects are not that interesting or inspiring for them. ISFPs really don’t like studying or feeling forced to learn about a subject which is boring to them. They often find themselves becoming distracted or pulled in a different direction which is more interesting. ISFPs care about doing well in school and pleasing others, but they just have a hard time finding the patience to sit down and study a subject which they don’t like. ESFPs often struggle to study when they are younger because they find themselves losing patience rather quickly. ESFPs are often capable of studying and of remembering details, but they simply don’t want tp. When the ESFP feels obligated to do something it can be challenging for them to really find the motivation for this. It has to be their choice, and it has to be something the ESFP really wants for them to be good at studying.